When kids play sports, ride bikes, and horse around with their friends and siblings, the occasional accident is bound to happen. If your child knocks out a tooth, it is important not to panic. You need to stay calm and take immediate action to improve the chance of being able to save the tooth. Put a piece of sterile gauze over the socket and tell your child to hold it in place or bite down on it to stop the bleeding. Try to find the tooth. If the tooth is dirty, rinse it with water. Do not touch the root when you handle the tooth or scrub it with any type of soap. If possible, replace the tooth in the socket. If you can’t put the tooth back in the socket, put it in a container of milk, saliva, or saltwater. 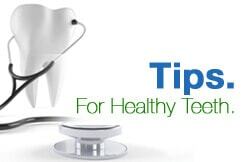 Do not wrap the tooth in a napkin or let it dry out because that will make it less likely to reattach. Take your child and the tooth to a pediatric dentist as soon as possible. If you can’t find the tooth, it could be stuck in your child’s mouth. Your child’s dentist can take x-rays to find it. If a baby tooth is knocked out before Mother Nature had intended, it can lead to crowding in the empty space, which means that there might not be enough room for the permanent tooth to erupt. Your dentist may put a space maintainer in your child’s mouth to hold the empty space open until the permanent tooth is ready to erupt. If your child knocks out a permanent tooth, it may be able to reattach if it is held in position for a period of several weeks. Your pediatric dentist will use a thin plastic or metal wire to splint the tooth to the surrounding teeth. The ligaments that connect the bone to the tooth will regrow. Your dentist will remove the splint once the tooth has reattached. If your child’s permanent tooth does not reattach, your dentist may recommend an implant or a bridge. An implant consists of a titanium post inserted in the jawbone that grows with the bone for a few months. After the implant is embedded in the bone, the dentist will attach an abutment and a crown. A bridge consists of a false tooth that is attached to the natural teeth on either side for support. If your child is involved in an accident that knocks out a tooth, call CT Pediatric Dentistry right away. We have a dentist on-call after normal business hours who will assess the situation and recommend the right treatment to restore your child’s smile. We are also available for all of your child’s routine dental needs.